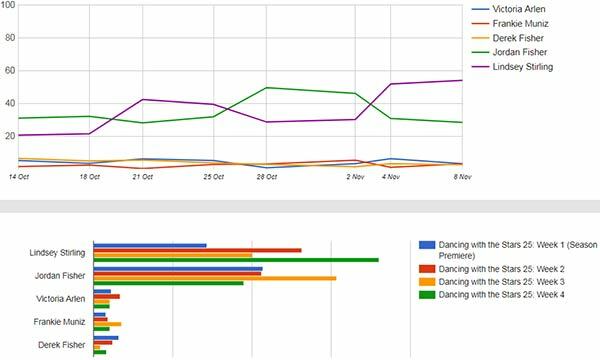 Our users at Gold Derby are getting whiplash from the rivalry between violinist Lindsey Stirling and Broadway actor Jordan Fisher on “Dancing with the Stars.” Each week one replaces the other as the frontrunner to take home the Mirror Ball Trophy at the end of the season. Fisher was the favorite going into the season premiere episode, after which Stirling impressed our users enough for them to put her on top. After a middling score on “Ballroom Night” in week two, Stirling fell and Fisher took back the top spot. But on “Guilty Pleasures Night” on week three Stirling gave the highest-scoring performance of the season so far, and now she’s back in the catbird seat. As of this writing Stirling has her biggest lead to date with odds of 5/6, which translates to a 54% chance of winning the Mirror Ball Trophy. Those odds are significantly better than the last time she pulled ahead in our odds: in week two she had leading 3/2 odds, or a 39% chance of winning. Fisher drops to second place with 5/2 odds (28% chance of winning). That still makes him highly competitive, but it’s the lowest he’s ever been in our odds. That may be because his “Guilty Pleasures” Charleston greatly divided the judges over the content of its choreography. It looks like this season has become strictly a two-way race as the rest of the field is far behind. Paralympian Victoria Arlen trails in third place with distant 33/1 odds (3.1% chance of winning), while actor Frankie Muniz is fourth, also with 33/1 odds (3.0% chance of winning). What do you think? Will Stirling and Fisher continue to dominate while the rest of the field battles for third place? Check out the graphs below to see the topsy-turvy momentum of the season. Click on it to see more prediction stats.